Bangkok's street food scene can provide some of the best food you will eat while in Thailand, but could also destroy your guts for anywhere from a few hours to a week or more. If you only plan on spending a short time in Thailand, it's unlikely that you will be in Bangkok for more than a few days. Which is a good thing in many ways. But it also means that you will have to make the decision about whether you want to take the street food risk. What many people may not know, is that much of the street food in Bangkok (and in Thailand in general) just isn't that good. Poor hygiene is the biggest problem. Lack of refrigeration for most street vendors means that bacteria can develop quickly. Also, poor cleaning standards and cross contamination from any number of things can result in a gut shredding experience that you won't soon forget. Another negative consideration: it is quite possible that there is not a single type of food that CANNOT be infused with the taste of car exhaust fumes. Fresh fruit, barbecued pork skewers, noodles with soup, and sticky rice can all fall prey to that nasty unwanted flavour additive that comes from the millions of cars on the clogged streets of Bangkok. Finally, a somewhat winsome view exists for some tourists that all hard-working Thais who work as street food vendors must be capable of whipping up simple, delicious fare just oozing with flavour. Not so. A lot of inedible crap created with cheap ingredients is peddled on the streets of Bangkok. Of course, if you have the time, you can find some fabulous, inexpensive street cuisine in the Thai capital. A good way to suss out a potentially good location is to hang around for a for a bit and check out what kind of business a street vendor does. The majority of the those lining up to buy from the vendor (except in high tourist areas) will be Thais who are repeat customers. Many repeat customers, equals a good reputation and high turnover of stock. One of the Bangkok street-food classics is grilled pork skewers. For barbecued meat, it is always best to ensure that it just came off the grill. Still, if you eye up some nicely done skewers (go for the ones that are well done with the beginnings of a nice caramelized surface), indicate to the vendor that you would like them to get a few more minutes on the heat. And the most laid back vendors won't mind if you pick up the skewers and place them on the grill yourself. 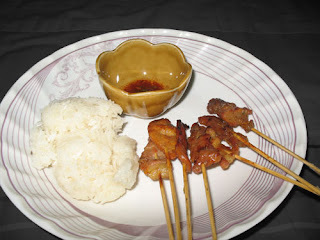 Served up with some hot sauce and sticky rice, it's a nice afternoon or evening snack when you are feeling a bit peckish but aren't ready to sit down for a full meal. The thinner the cut the more tastier the skewers are likely to be. Still a great bargain after all these years, you can usually buy five to seven skewers and some sticky rice for less than 30 baht (about 1 US dollar). Then you can take in the weird and wonderful sights of Bangkok as you lay into that tender, perfectly barbecued meat and taste the smoky, garlic and soy marinade flavour coming through.